a marine and landscape artist was born in Houston, Texas. The Gonzales family moved to Galveston, Texas where he worked full time at the age of 12 for his prominent father in his cotton brokerage firm. During his free time when hunting on Galveston Island and trips to Boston he would paint, which he showed a remarkable talent at this early age. During a trip in 1888 where he was touring the rocky coast of Maine, he met Winslow Homer. Homer’s brother had a rope factory in Galveston and introduced Gonzales to him. 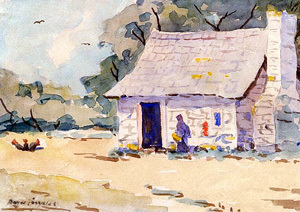 Homer’s watercolor style had an important influence on Boyer’s art future. In 1894 Gonzales received his first formal art training in Annisquan, Massachusetts from the colorist William J. Whittemore. Following his studies, Gonzales traveled to Mexico to do a series of watercolors of the people of Mexico and its villages. During the summer of 1900 he studied in Boston with Walter Lansil, who introduced him to the works of the Dutch master and marine painter, Hendrick Willem Mesdag. The following year Gonzales sold the firm of Thomas Gonzales and Son, but remained in the city as a bookkeeper. In 1904 he was invited to show in the Texas Pavilion at the St. Louis World's Fair. In 1908 Gonzales traveled to Europe and met Mesdag, the Dutch painter of marine scenes, who was to have such an influence on his later works. He built a studio in Woodstock, New York, in 1919 and thereafter spent his summers there and his winters in Galveston and San Antonio. Gonzales also painted at Maine, Taos, New Mexico and occasionally in Mexico. Boyer Gonzales won medals for work exhibited in Dallas in 1921 and 1924 and a prize at the 1926 Southern States Art League competitive exhibition. His work was exhibited at the Fort Worth Museum of Art, the Galveston Art League, the Houston Fine Arts Museum, and at galleries in San Antonio, Dallas, Waco, and New York City. Solo exhibitions of his work were mounted by the Witte Museum in 1927 and 1936; the later exhibition, a memorial to the artist, circulated to several other Texas museums. 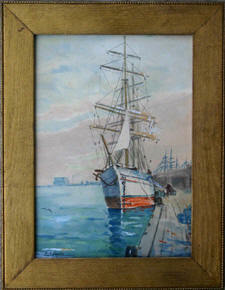 Gonzales was a member of the New York Water Color Club, the National Arts Club, the American Water Color Society, the American Federation of Art, the Washington Water color Club, the Mississippi Art Association, and the Salmagundi Club of New York City, where he exhibited with regularity. He was also an active member of the Texas Fine Arts Association, the Southern States Art League, and the Galveston Art League.